Meet Rael Kakulilma. Rael grew up in Karagwe, Tanzania. Currently, Rael (also known as “Rachel”) lives in St. Paul with her husband Phares and their two children. 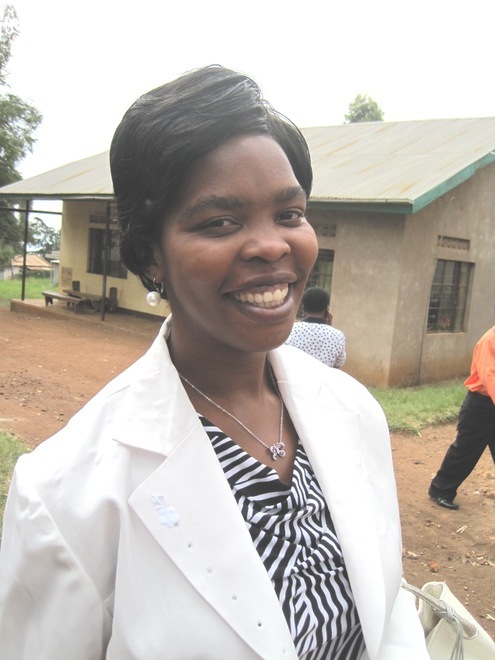 Below is her Story from Karagwe that she shared at the ETI fundraiser last May. Many attendees told me that her story was the highlight of an already exciting event and asked me to post it. Here is her story. Dear friends of ETI, Ladies and Gentlemen, I would like to take this opportunity to express my sincere appreciation to Jan, Steve and the ETI Board for granting me this opportunity to share my life story in Karagwe. On behalf of myself and people of Karagwe, I would like also to thank donors for what you’re doing to support Karagwe Community. Your support is making people’s dreams become true. KARUCO is the key to people’s transformation in Karagwe. The University will bring hopes and new perspectives among the Tanzanians in general. I’m here today to share my life story which is not unique in Karagwe. It resembles many stories in Karagwe. Through this story others may understand why it is important to continue to support development in Karagwe. My name is Rael Kakulima. I was born and raised in Karagwe, Tanzania. My father who was a small farmer and an agricultural extension officer, had several wives with eighteen children. My mother was a fourth wife and had eight children with him. I am the fifth child. At the age of three, I had to stay with my stepmother while my father and mother separated and my siblings went to live with my mother. I did not meet my mother again until when I was fifteen years old. It was so hard and painful, but I had no choice. At the age of eight, I started kindergarten school at Bugene Primary School and the following year I joined the same school for primary education. I walked from home to school for about three miles every day; Monday to Friday without breakfast or lunch. Like many young girls in Karagwe, I had lot of tasks to complete after school. I had to help my stepmother with tasks like collecting firewood for cooking, cooking, washing dishes, feeding animals, gardening, fetching water from the water source that was also about three miles from home. Walking to the water source was always risky business. I went down and up hills, and through the bushes to find my way to the water source. Paths to the source are well known and girls fetching water are at risk for many things. But, God was on my side. When I was in the first grade, my father was imprisoned without trial for a crime he did not commit, and died in the prison after six years without trial. Our family did not have enough money to send children to school so my three brothers could not continue. Later, my sisters were not able to continue with secondary education but I was the exception selected to join the public secondary school. The school was almost impossible! I remember my stepbrother who lived in Dar es Salaam had to travel back when he heard that some of the family members were planning to stop supporting my education. My brother encouraged them to continue with their support for my education regardless of being a female in the family. My stepbrother offered not only a financial assistance but also emotional support and I am grateful. At the age of 16, I was sent to live with and care for my grandmother who was over 100 years old. I was fully in charge of my grandmother’s total care so in addition to school I was fetching water, cooking, farming, selling juice and bananas in the street to earn money for medicine, care for grandmother and myself, and purchase school uniforms and supplies. Life was not easy for me and for my grandma because we were never sure where we could get food, medical care, and other basic needs. I remember the day when my grandma was sick but the family could not afford to take her to the hospital. I had to buy what medicine I could for my grandma who died in my hands while feeding her. Despite the fact that life was not easy for me, I trusted in God, I kept my faith in him. I did not give up for school. My stepbrother believed in me and encouraged me to keep going. I did. After four years of Secondary School, I was selected to join a boarding High School for girls. After high school, I joined the college and university where I was trained as a teacher. I’m married to Phares Kakulima whom I met at Karagwe secondary school working as a school chaplain. We got married in 2004 and we have two children; Akiza and Devin. Currently, we are here in Minnesota. Tomorrow 6/4 is my graduation day. I’m graduating with Masters in Educational Leadership from Saint Mary’s University of Minnesota. My goal is to complete a Doctorate in Educational Leadership which I have an admission already! Hope to start in the coming fall or the spring next year if God wishes. But more important, I hope to return to Karagwe help with the Community Development Initiatives and teach at KARUCO University college. Education, Leadership and community Development are critical for entire community of Karagwe and its neighbors. I’m eager to be a part change agent in my community. Be a role model to the women/girls and the entire community to bring hope and growth mindset towards the importance of education in our community. Ladies and Gentlemen: As I said, my story is not an isolated one. It is part of many similar stories about women in Tanzania. I regard myself to be a lucky one but would wish to see many others move upward in education. I am sharing my personal story to express an example of real life of African women who live in great danger of poverty, superstitions, wars, diseases like malaria, tuberculosis, and HIV/Aids. Women and other people of different ages face these dangers. Education is the only tool to liberate the people from undesirable conditions. Through Educate Tanzania (ETI) you’re paving the way to educate Karagwe community and Tanzania in general. Thank you very much for your support. You are making a difference more than you can imagine.